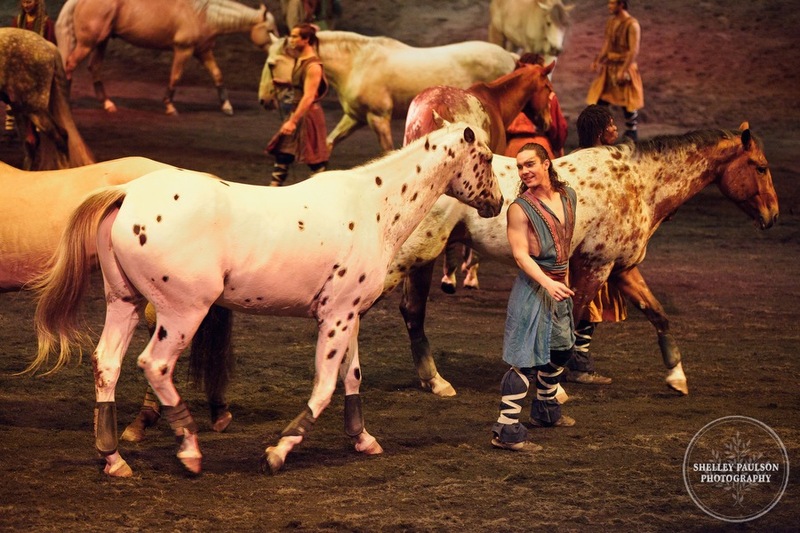 A couple weeks back I was invited to attend the opening night of Cavalia's Odysseo. I will admit when I first received the invite I was not really sure what it was. I knew I had seen billboards all over town, literally, but was not sure what the show really was. I looked it up online and decided it looked interesting. The only way I could describe what it looked like was a Cirque du Soleil with horses. I was interested and excited to attend. John had to work so I took my mom along with the boys. The show is in Scottsdale under a large tent. We had great seats only a few rows up, but in reality it seemed that there was really no bad seat in the place. As the show began the sheer curtains covered the staging area and messages showed on the curtains. It began with a little trivia about the show. It was fun answering the questions and seeing if we were right. The facts were also very interesting such as the show consists of over 50 horses and everyone of them male, 22 stallions and 39 geldings. The show was breathtaking. I really didn't know much to expect but I was amazed at the performance. It started with a group of horses running free as a woman sang. She stood up and began to walk around in the middle and the horses began to move along with her and follow. The trainers would walk around and the horses would follow behind. There was so much love you could just see between the horses and the trainers. The moving background sets the journey through different seasons. There is no dialogue, only a band and gypsy style singing from a female Roman singer. The show consisted of some trick riding with both men and women standing on the horses, riding backwards, hanging from the stirrups, and other trick riding. There were also acrobats swinging from hoops and silks. There was a large merry-go-round that was suspended from the ceiling for acrobats to dance and swing from. There were tribe like dancers that tumbled, drummed, and somersaulted around. You can get a small taste of what we saw in the video below. My mom and I were both amazed at the way the horses responded to the trainers and how well they were able to all come together. The horse would like up and follow behind the trainers and at times there would be up to 12 or more horses and a single trainer. They would all line up and follow behind as a group. Jayden loved the Merry Go Round and told me it must hurt them because they were hanging by almost nothing. Evan's favorite part was when the tribe like dancers were out. They would dance, drum, tumble, and yell out to get the audience involved. I really don't know what more to say about the show. I went with little expectations since I really didn't know what it was about and left with a sense of awe. It was truly beautiful and amazing. As the show came to the end the stage began to flood with water. 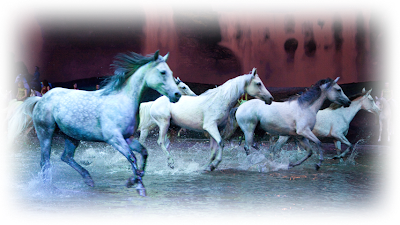 We thought for sure it was done and over, but then the horses all came running out to run through the water. The show was enhanced with the presence of the water. The show is still going on now through the month of January in Scottsdale, AZ. I highly recommend this show. I really wish I could go back and see it again. In fact Jayden asked me the other day when he saw a billboard if he could go to the horse show again. You can get more information about the show and purchase tickets here. We saw a Cavalia show last year and it was amazing -- my daughter rides and does silks so the combination in the show really made her happy. This show does sound amazing..my daughter would probably love it!